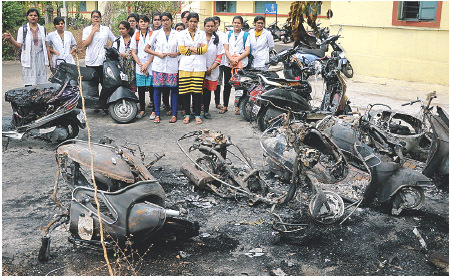 Unknown arsonists torched 10 two-wheelers at the parking of girls hostel-2 of Government Medical College and Hospital (GMCH), creating panic on intervening night of Wednesday and Thursday. The incident is a sever blow to security at GMCH. Recently, some vehicles were torched in Nashik and Pune and this incident in city indicates that Nagpur is on the same sorry path.